The rubab is a musical instrument from Central Asia – a type of double-chambered lute. 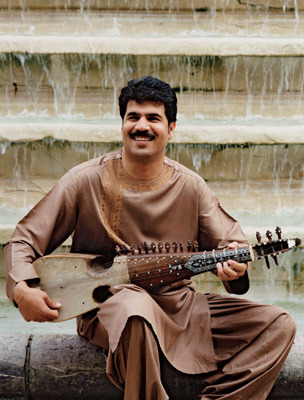 Come and listen to the brilliant Afghan rubab virtuoso Homayun Sakhi play Afghan music representing the coming together of cultural influences from the east, north, and west of present-day Afghanistan. The great historical empires of Persia, Central Asia, and India have all contributed instruments, genres, and performance styles to Afghanistan’s diverse musical landscape. Accompanied by tabla player Yusuf Mahmoud, Homayun Sakhi performs a full raga and folk pieces. During Afghanistan’s long years of armed conflict, when music was heavily controlled, censored and eventually banned, the classical rubab style not only survived but reached new creative heights. Homayun Sakhi works within this traditional musical idiom, enriching and expanding its expressive power while respecting the taste and sensibility passed down from master musicians of the past. In collaboration with the Aga Khan Music Initiative, a programme of the Aga Khan Trust for Culture. To support this talented artist, Afghan Events in association with Osterley Star Banquiting Suites organised a Rubab & Ghazal Night in London on Saturday 21 May 2011. Venue:764 Great West Road,Isleworth,London, TW 7 5NA , for more info please call us on 07976504317. He realy is amazing and great player of the Afghan national instrument Rabab. best wishes towards him from one of his fannn.